Plants epiphytic, on rock, or rarely terrestrial. 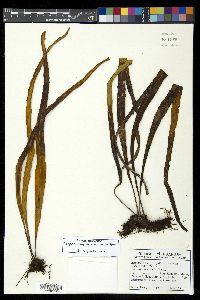 Stems often long-creeping, usually branched, 1--2.5 mm diam., not whitish pruinose; scales bicolored with dark central region, round to ovate-lanceolate or subulate, clathrate toward center, glabrous or pubescent with reddish brown hairs, margins transparent, erose-denticulate to fringed-ciliate. 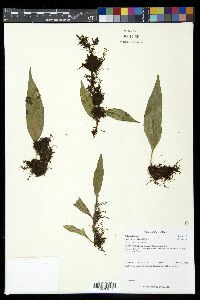 Leaves monomorphic, widely spaced, not conspicuously narrowed at tip, to 25 cm. Petiole green to dark brown or black, flattened to terete, often grooved proximally and winged distally. Blade oblong-linear to deltate, simple and entire or deeply pinnatifid, not pectinate, with fewer than 25 pairs of segments, not glaucous, with conspicuous peltate scales on abaxial surface; rachis sparsely to densely scaly abaxially, glabrous to sparsely scaly adaxially; scales ovate-lanceolate to spheric, peltate, clathrate toward center. Segments (when present) linear to oblong; margins entire to crenulate; apex rounded. Venation mostly free or complexly anastomosing, with 1--several included veinlets in fertile areoles. Sori often confined to distal 1/2 of leaf, discrete or confluent, circular to oval when immature, borne at ends of single veins or at junction of several veinlets, in 1 row on either side of midrib; indument of ephemeral, peltate scales covering immature sori. Spores smooth with scattered spheric deposits or slightly papillate or verrucose. x = 34, 35, 37. 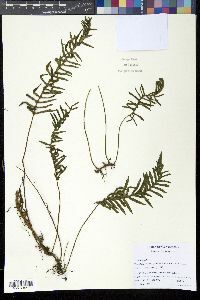 Pleopeltis is a neotropical genus of mostly epiphytic ferns. Its center of diversity is in southern Mexico and Central America. 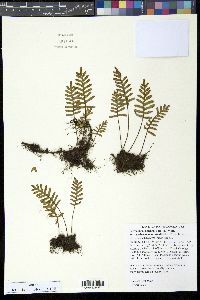 The genus is currently under revision, and preliminary data indicate that certain scaly-leaved species traditionally placed in the genus Polypodium are actually more closely related to Pleopeltis than they are to Polypodium . 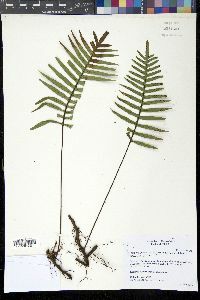 The two North American species of this scaly Polypodium group recently have been transferred to Pleopeltis (M. D. Windham 1993) and are similarly treated here. 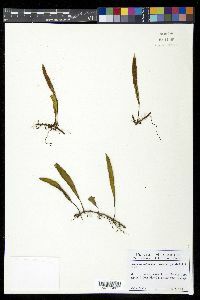 RHIZOMES: slender, short-creeping, not pruinose or glaucous, densely scaly, the scales strongly bicolorous, somewhat clathrate. LEAVES: usually relatively widely spaced, evergreen, hygroscopic. 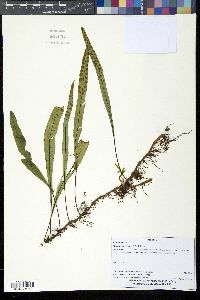 PETIOLES: mostly shorter than to about as long as the blade. BLADES: leathery, the lobes linear-oblong, the margins entire or minutely crenate, glabrous adaxially, with conspicuous peltate scales scattered over the entire abaxial surface. VENATION: with occasional simple areoles, difficult to observe. SORI: surficial or from shallow pits in the blade surface, when young with a dense covering of ephemeral peltate scales similar to those of the blade surface. PARAPHYSES: absent. SPORANGIA: with the capsule nonglandular. NOTES: 50 or more spp., New World, Afr., Asia. (Greek for “many” and “shield”). 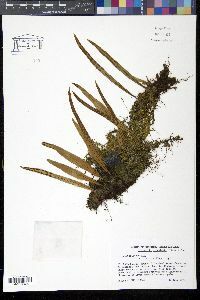 Until recently, Pleopeltis was restricted to a small group of mostly simple-leaved ferns. 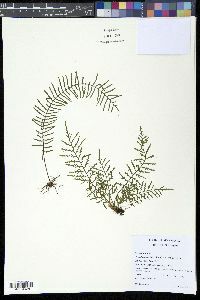 Phylogenetic research on the Polypodiaceae has indicated that most of the groups of New World polypodies with peltate leaf scales are more closely related to Pleopeltis than Polypodium sensu stricto and an expanded circumscription of the genus has become accepted by many pteridologists. REFERENCES: Yatskievych, G. and M.D. Windham. Vascular Plants of Arizona: Polypodiaceae. CANOTIA 5 (1): 34-38, 2009.